Belinda and James had a gorgeous South Australian wedding surrounded by all their family and friends from both England and Australia. Belinda looked stunning in the Hopefield dress with the Voulaire overskirt, highlighting the open back. With a baby on the way, the couple looked happier than ever. A perfect wedding - if only the day could have lasted longer! Read on to hear about Belinda’s tips on planning an overseas wedding. 1.Please describe the style of your wedding? Our wedding was an outdoor summer wedding in rural South West France. 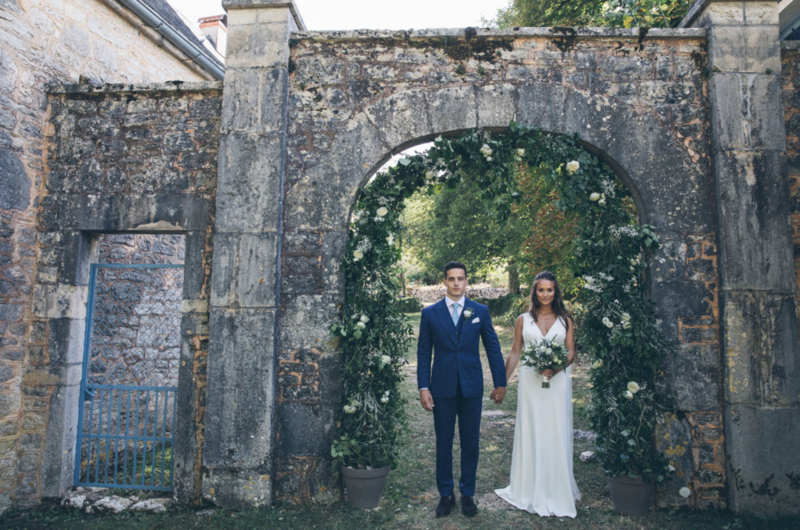 The theme was simple, elegant and rustic with lots of greenery and in keeping with the beautiful French countryside. We got engaged in August 2017 when we were on holiday in the stunning hilltop village of Taormina, Sicily. I chose the Haliton dress in crepe. I saw it with my Mum in a lovely shop called Frou Frou in Tunbridge Wells and any other dress I tried on after that did not compare. So my Mum and I went with Maid of Honour to try it on again at Charlie Brear in London and as soon as I tried it on again I knew I had to get it. I loved how simple and effortless the dress was and how I felt so like myself in it. I loved the little buttons that added detail to the front and the low v at the back. I knew I didn't want a big layered dress as I would be too hot in the summer heat, so it ticked every box for me! I absolutely loved wedding dress shopping and it was a really special experience to share with my Mum and my Maid of Honour and something we will never forget. It felt a bit alien at first, trying on all these fancy dresses that I would never normally wear but as soon as we visited Charlie Brear where all the dresses were so simple and elegant I felt so comfortable and I was so excited to try on all the dresses. Don't focus too much on all the individual components of the dress too much, just find a dress you feel amazing in and feel like yourself. I wouldn't get too stressed about finding the perfect dress that you have in your mind. Go shopping with an open mind, try on lots of different styles, have loads of fun and you'll soon figure out which style you are drawn to. Then go with whatever dress you feel amazing in. If you feel confident and happy wearing the dress then you will look amazing! I felt delighted I had found a dress that I loved so much and I had such a special feeling about it. It was all a bit of a blur of excitement and we went straight out for some celebratory drinks, so when the dress arrived months later I was worried I couldn't remember what it was like and I was worried I had rushed into buying it. But soon enough, with the help of my Mum and my Maid of Honour, I realised I had absolutely made the right decision! I wore Kurt Geiger white heels with a slim gold strap and a gold strip down the back. They had a block heel and they were a medium height so they were so comfy to wear all day and all night! Yes! The dress couldn't be worn with a bra as it was very low at the front and back and I was worried it wouldn't support me without a bra. But Charlie Brear suggested lots of great options and I ended up having cups sewn into the dress that gave me the perfect amount of support and I felt so comfortable not wearing a bra! I used The Bridal Stylists, which is a team of wedding makeup artists and hair stylists who are based in the South East and London. They gave me a list of the stylists that would be willing to travel to the South of France and then from there I looked at their instagram and chose the amazing Sophie Cooke, who was absolutely phenomenal! She also came with her assistant Jess Cook who was also amazing and I couldn't recommend enough! We got married in July in the grounds of my parents house in South West France. The house was an old French police barracks and ever since we got engaged, it was our dream wedding venue. The wedding ceremony was outside on the back terrace of the house and we had a drinks reception by the pool, dinner in our lovely next door neighbours garden and the dance floor was on our lawn! My Dad and I had a lovely long walk around the garden before we began our aisle walk. This was so special to have such a long aisle walk and it calmed my nerves walking round the familiar setting of our garden. So when we came to walking down the aisle, I enjoyed every moment and felt so overwhelmed with happiness seeing all our friends and family and looking up as my husband to be on the terrace! Something old/borrowed - my Granny's diamond eternity ring. Something new - my new blue topaz earrings were a wedding gift from my husband. Something blue - my two gorgeous nephews, wearing blue shorts, waistcoats and bow ties. We followed a lot of French traditions such as the 'La fontaine à Champagne', when following the ceremony my husband and I poured the first bottle of champagne for the drinks reception into a tower of 100 champagne coupes! The speeches were absolutely brilliant and they had everyone crying with laughter! The phenomenal Shanna Jones! We cannot thank her enough, she is so talented and her photographs are incredible! She captured the day so beautifully! We genuinely loved every single part of the day, we were so happy with all the suppliers we chose and all the decisions we made, we couldn't have had a happier day! It was quite daunting to plan a wedding in a different country at a very old house that was not set up as a wedding venue! It was our dream to get married there and we knew it wouldn't be easy. But we had an amazing wedding planner based in France to help us and LOTS of help and support from our families! 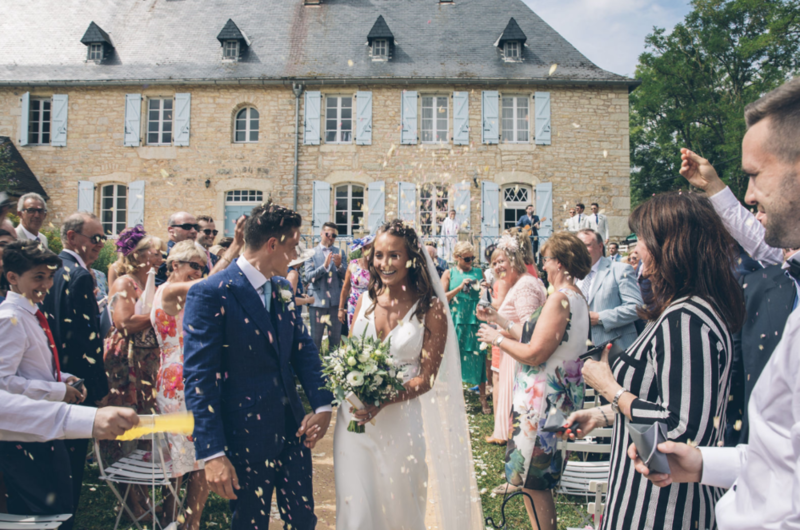 We loved our 'planning trips' to France in the build up to the wedding and it was such an exciting project, when it came together it was worth all the hard work! I will certainly keep my dress and veil forever! I have had my dress dry cleaned and almost all the red wine stains have come out! It's hanging in our bedroom and it brings back so many happy memories just looking at it! Honestly, the whole day...the company of our amazing friends and family, getting married and saying our vows in such a beautiful setting and somewhere so special to both of us, the amazing Brian Kennedy singing in our ceremony, our siblings doing the most wonderful readings, the fantastic speeches, our first dance, the amazing music and the most incredible night of partying! 1. Enjoy every moment of your wedding day, stop to take a moment to sit back and absorb everything going on around you. 2. Involve your friends and family in all aspects of your day such, for example making the cake or performing in your ceremony, it will make the day even more special for you and for them too! 3. Enjoy the process of planning the wedding as much as the day itself! It's such an exciting time and you only get to do it once! 4. Wear comfy shoes so you can dance all night! 5. Spread out your wedding over a few days if you can. We had a drinks party the day before the wedding and a pool party the day after....it's the most incredible time of your life and you don't want it to be over in a flash! Ceremony Venue - The grounds of my parents' house in South West France, an old police barracks in the French countryside. Photographer/Videographer - The incredible Shanna Jones. Bridesmaids' dresses - The bridesmaids wore oyster dresses from 'We are Rewritten' in a variety of gorgeous styles. Entertainment - For our evening entertainment we had the absolutely incredible Brightlights Band, an English band based on the French Riviera. We cannot recommend them enough, they were INSANE and the dance floor was filled all night! Cake Supplier - My Mum made the most delicious victoria sponge cake, our favourite! Did you catch last Month’s friday bride, Belinda?